I am really excited to announce that Paul Bloedel has successfully built an AROS version of his Hollywood-based Icon Editor, which will be included in Icaros Desktop 2.2.5 under the "Utilities" drawer. This means that it will be available on both Live! 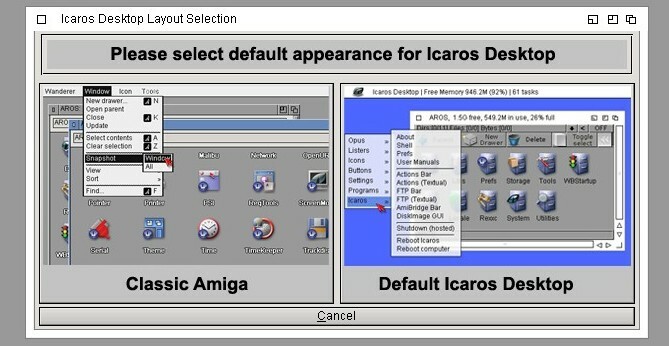 and Light edition of the distribution, since I feel that a proper editor for icons should be part of the 'core utils' that an Amiganoid system should provide by default. Icon Editor is a quite advanced paint program, properly handling double-state Amiga icons with alpha channel, which allows us to create and modify .info files without requiring more programs to do that. Yes, I know, any experienced coder would find it trivial to do. However I am a system administrator, not a developer, so please forgive my enthusiasm. However, embedding images is not only a style excercise, but it may bring other goodies to Icaros in the (hopefully near) future. If you followed AROS and Amiga communities, you may have noticed my insisting requests for a C command that would modify AHI master volume. AROS does not have the 'mixer' commodity, nor it has a proper volume gadget on its workbench, but nothing should stop me to fill the gap once I had the proper tools. On the left, you can see my LUA based GUI: now I just need the C command to actually change volume. My dream would be turning it into a commodity but, well, that's really beyond my skills and, after all, I still have to make it work, first.